A sensitive technique of non-isotopic in situ hybridization (NISH) is presented, which permits the detection of human growth hormone (hGH) mRNA in routinely formalin-fixed, paraffin-embedded transgenic mouse tissues and human post mortem pituitaries; the latter were used as positive tissue controls in this study. In addition, a double staining procedure combining NISH and immunohistochemistry for the visualization of both hGH and hGH mRNA in the same paraffin section is described. Digoxigenin-labelled antisense hGH RNA was used for NISH of hGH mRNA. The NISH protocol was based upon an established radioactive method. 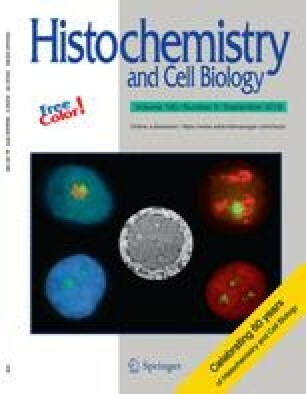 Alkaline phosphatase and horseradish peroxidase-based immunoenzymatic procedures for the detection of digoxigenin-labelled RNA probes using different chromogens [4-nitro blue tetrazolium chloride (NBT), Fast Blue BB, New Fuchsin, and 3,3′-diaminobenzidine tetrahydrochloride (DAB) with or without intensification of the DAB staining] were compared. The proteolytic tissue pretreatment and the detection procedure were found to be the most critical steps for successful visualization of hGH mRNA. After optimization of the permeabilization conditions, hGH mRNA could be visualized in each case studied when alkaline phosphatase/NBT-based detection was employed. The NISH technique presented here, performed either separately or in combination with immunohistochemistry, permits retrospective analyses, of hGH (trans)gene expression in archival, paraffin-embedded specimens.